This special Duncan PRO Z Player Edition came with the MOD Spacers pre-installed (see Duncan Pro Z standard release). However, you can unscrew the yo-yo to remove the spacers, then reassemble the yo-yo to convert it to a traditional, responsive looping yo-yo. The MOD Spacers are the dish-shaped, angular pieces with the black Duncan Friction Stickers (see Internals picture). The MOD Spacers of the regular Pro Z always came in a different color from the body halves. However, for this edition only, the MOD Spacers were molded in the same translucent neon yellow color as the body. Also, the side caps on this edition glow. 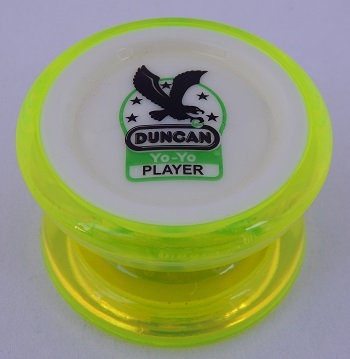 One cap is imprinted with the regular Pro Z logo; the opposite side is imprinted with a custom "Duncan Yo-Yo Player" graphic reminiscent of the Duncan Flying Eagle Champion patch from the 1990s. Yo-Yo came polybagged only. Uses a size A ball bearing.